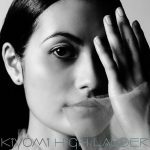 Kiyomi has an engaging video to accompany her new song “High Ladder,” and Flaunt Magazine has the premiere. The site quotes the arts about the inspiration behind her song. “I wrote ‘High Ladder,” she told the site, “when chasing the dream was like chasing moonlight. It was a time of many closed doors and this song started to open them. High Ladder comes from my head and my heart and I hope it resonates with other dreamers.” The video, directed by iconic hair sculptor Charlie Le Mindu, is a wild, substantive, and gorgeous visual affair. Check it out here.